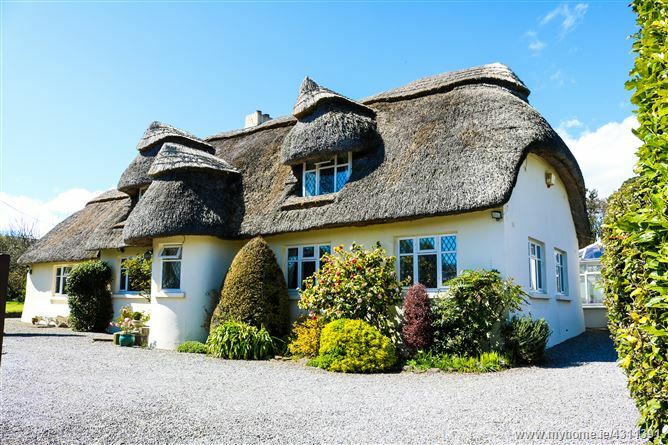 McGovern Estates is proud to present ‘Creech Barrow’ - this magnificent thatched cottage family home located in the heart of Delgany has all of the romantic charm of a country cottage without compromising on modern conveniences. It is situated on a beautifully private and mature manicured 1/3 acre garden and benefits from a south westerly orientation which enjoys the sun in the afternoon and evenings, ideal for entertaining in the summer months. A separate detached granny flat also sits on the site and contains its own kitchen, living room, bathroom and gallery style bedroom. The interior has been beautifully decorated with classic colour schemes and high quality finishes throughout. The property is full of charm, character and offers a wonderful flow between the well proportioned living spaces. The reception rooms all open in to one another and the drawing room and kitchen open out to the stunning gardens which surround the property. Internal viewing of ‘Creech Barrow’ is highly recommended. The property was originally built in c. 1950 and has been consistently restored and updated to provide all the comforts of a 21st century luxury home. The drawing room is a spacious, later addition to the property and is sympathetic to the original style and compliments the many heritage features with exposed duck egg blue wooden beams which run across the ceilings. The accommodation briefly comprises a cosy sitting room warmed by an open fire, which leads onto the dining room where dark rafters lend a real country feel. This dining area leads to a bright and contemporary country-style kitchen which gives access to a patio area with a cleverly planted herb garden and water feature. The sitting room also leads to the drawing room which is used as a double height living area with a bay window overlooking the gardens and open fire place also featuring. There are 3 bedrooms downstairs, and upstairs has a beautifully finished master bedroom with a bay window seating area and his and hers dressing rooms. Across the landing there is a wonderful bathroom which was converted from a former bedroom. The gardens at ‘Creech Barrow’ are perfectly manicured and feature a large lawn area to the side and a patio to the rear, bordered by beautifully matured trees and shrubs, the property is accessed via electric gates onto a gravel driveway which provides ample space for numerous cars. The property is situated in the heart of Delgany village with access to many wonderful amenities. The renowned Pigeon House Cafe is located around the corner along with an organic butcher and a village store. Greystones town is within easy reach and all your needs will be catered for with a wonderful selection of bistros, boutiques, restaurants and shops, the village library, churches and a large number of highly regarded schools. A host of sport and leisure clubs abound in the area. The Shoreline Leisure Centre and swimming pool is nearby, as are a great choice of renowned golf clubs, including Delgany, Greystones and Druids Glen. Greystones and Delgany are situated in a stunning location between the coast and the Wicklow mountains, giving easy access to the local beaches, countryside and nearby villages like Enniskerry. The commuter will be delighted at the easy access to local bus stops and the DART station is just a short drive away. The N11/M50 is also within easy reach making for an easy commute to the city, airport and beyond. Solid timber floors. Intercom system. Digital alarm system. Understair storage and cloak hanging area. Solid timber floors. Television point. Feature open brick fire place with tiled hearth. Stained beam ceiling and double doors to drawing room. Vaulted beam ceiling. Solid timber floors. Window seat overlooking rear garden. Multi aspect windows. Feature brick fire place with solid fuel burning stove resting on a brick hearth with solid wood mantle over. Door to rear garden. Solid timber floors. Stained beamed ceiling. Atrium part vaulted ceiling with timber beams and wood panelling. Window overlooking side garden and double folding doors lead to kitchen. This Arthur Ryan kitchen features a Sovereign AGA style cooker and grey painted shaker style press unit. Pantry press units, display cabinets, wine rack, worktops. Range of integrated Neff appliances and Siemens four ring electric hob. Island unit with storage and breakfast bar. Door leads to patio area and utility room. Solid timber floors. Bath with antique style fittings incorporating telephone hand shower, pedestal wash hand basin, WC. Decorative coving. Part tiled walls. Dual aspect windows looking to side and front. Decorative coving. Television point. Range of louvered door built in wardrobes and cupboards over. Inset wardrobes with hanging area and louvered door cupboards over. Decorative coving. Telephone point. Vaulted ceiling. Beautiful window seating area overlooking front gardens. Access to eaves storage. Two walk-in dressing areas. There is folding cupboard doors which open up to a wash hand basin with storage under. Vaulted ceiling. Dormer window to front. Roll top cast iron bath with claw feet. His and hers period wash hand basins with marble tops and cupboards beneath. The property is accessed via electric gates onto a gravelled driveway which provides space for multiple cars. The driveway leads to a private lawn area and patio gardens that surround the property and extend to approximately 1/3 of an acre. The rear of the property comprises a beautiful patio area accessed for either side of the property and from the kitchen. The gardens are south and west facing benefiting of afternoon and evening sun. Tongue and groove polished wood flooring. Solid fuel burning stove set into a brick fireplace with a stone raised hearth. Beamed timber panelled ceiling. Bay window. Atrium. Fully fitted kitchen with range of floor and wall based storage cupboards. Worktops. Integrated appliances. Stainless steel sink unit. Tiled splashbacks and timber panelling under the beams. Tiled flooring. Shower. Pedestal wash hand basin. WC. Vaulted ceiling. Eaves storage. Two large Velux windows. Window to rear. Recessed lighting. Polished timber floor. Ample storage space. On the N11 going south, take exit 10 for Delgany. Proceed past Delgany Golf Club and into Delgany Village. Take a left in the Village towards the Horse and Hound and continue past for 300 yards. ‘Creech Barrow’ will be located on your left hand side identified by a painted green fence and timber electric gates.